'Ace of spades' is a loud, proud and obnoxious song by the metal band Motörhead. It is universally regarded as their main anthem. For the lyrics, lead singer Lemmy said he 'used gambling metaphors, mostly cards and dice - when it comes to that sort of thing, I'm more into the one-arm bandits actually, but you can't really sing about spinning fruit, and the wheels coming down'. In March 2005, Q Magazine placed it at number 27 in its list of the 100 greatest guitar tracks, stating 'This song has an intro which wouldn't be out of place ushering in the end of the world'. 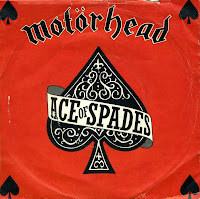 'Ace of spades reached number 15 after its original release in November 1980. In 1993, the single was re-released, coupled with a rather ill-advised but comical remix version. Although the band were not too pleased with the remix version, the single peaked at number 23 in the UK charts.